The Premier League’s sale of its overseas broadcasting rights for 2010-13 is just two countries away from being a “global sellout” worth £1.4bn. Only the rights deals for Albania and Russia have yet to be concluded. Intense bidding wars in key areas, mainly between pay-TV rivals in Asia, have sent prices soaring, which is good news for the Premier League clubs, and will also mean more money for the Football League. The Premier League is currently considering to what extent it will expand annual “solidarity payments” to the Football League, from the £21.6m given annually now for various uses between the 72 clubs. As sportingintelligence has previously reported, parachute payments to relegated clubs will rise by just over 40 per cent from £11.2m to £16m per year from this summer, and these payments are likely to extend beyond two years. The League has been motivated to share more money partly through a desire to see some (albeit small) closure of the gap between the top division and the rest. But it is the bumper overseas rights deals that will actually allow the increased spending. 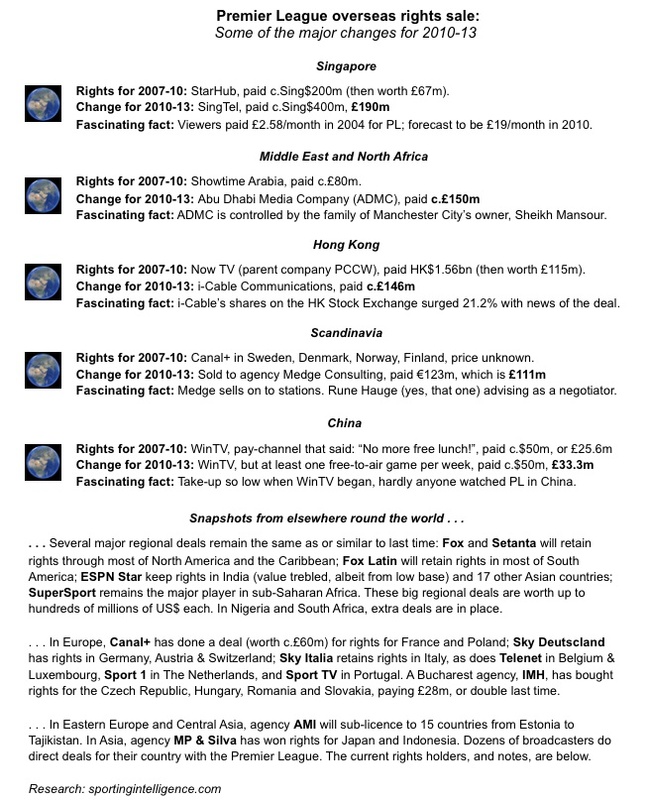 It seems likely the Premier League will more than double its overseas rights income from £625m last time. Some individual sales have seen massive surges in value, including in Singapore, which is now believed to be the single most lucrative territory. The current rights holder there, StarHub, paid around £67m for 2007-10, but lost out this time to rival SingTel. Local analysts say SingTel paid almost £200m for 2010-13. The bidding war in Hong Kong was almost as intense as PCCW’s Now TV, which paid around £115m last time, lost out to rival i-Cable, believed to have paid around £146m this time. In the Middle East and North Africa, a new broadcaster enters the market this year in the shape of the Abu Dhabi Media Company – owned by relatives of Manchester City’s owner Sheikh Mansour. The ADMC outbid Showtime Arabia, which paid around $120m last time. Local sources believe ADMC may have paid as much as $300m (£200m), and possibly even more. In Scandinavia, the League sold the rights for Denmark, Sweden, Norway and Finland to an agency, Medge Consulting, for £111m, and Medge will make a healthy mark-up, perhaps as much as 100 per cent, by selling them on. The League simply cannot do individual deals itself in all 211 countries where its games are shown, so sub-licencing and the sales of packets of regional rights is common. Still, the League has 98 broadcast partners, as well as its own new TV station, Premier League TV, which will provide “viewer ready” match footage, commentary and analysis for nations wanting to buy rights “off the shelf”. In the future, the League hopes PLTV could attract non-traditional buyers to the market, for example entrepreneurs who want to enter the football market but don’t have broadcasting capabilities themselves. As well as an array of new partners this time, the League will maintain long-term relationships with Fox (in North and Latin America, and Australia), ESPN (in large parts of Asia), Sky (in Germany, Italy and elsewhere) and Canal+, in France and Poland. The major changes for 2010-13 are in the panel immediately below, and beneath that is an extensive guide to the current broadcasters, many of whom have renewed their current deals. Late NB on graphic below: ADMC understood to have paid $350m, or £225m, for three years, as opposed to c.£150m as stated. Comprising: Bangladesh, Bhutan,Brunei, Cambodia, India, Indonesia, Laos, Malaysia, Maldives, Mongolia, Myanmar, Nepal, North Korea, Pakistan, Papua New Guinea, The Philippines, Sri Lanka, Taiwan. Note: The same broadcaster provides coverage in GERMANY, SWITZERLAND (games also on Canal+), LIECHTENSTEIN and LUXEMBOURG. Note: A new media partner is in place from 2010 onwards, the Modern Times Group. Comprising: Algeria, Bahrain, Egypt (games also on ERTU), Iran (also on IRIB), Iraq, Jordan, Kuwait, Lebanon, Libya, Morocco (also on TV2M), Oman, Qatar, Saudi Arabia, Somalia, Sudan, Syria, Tunisia, Yemen, United Arab Emirates. Note: Rights switch to Abu Dhabi Media Company from 2010. Local sources say previous value of rights was $120m, that ADMC entered the bidding at $150m and went up from there. Highest estimate of what ADMC finally paid is $300m, which is probably too high. Comprising: Anguilla, Antigua, Antilles, Aruba, Bahamas, Barbados, Bermuda, Bonaire, BVI, Cayman Islands, Turks & Caicos Islands, Cuba, Curacao, Dominica, Dominican Republic, Haiti, Honduras, Trinidad & Tobago, US Virgin Islands, USA. Comprising: American Samoa, Cook Islands, Fiji, Kiribati Islands, Tokelau, Tonga, Tuvalu, Vanuatu, Wallis & Futuna Islands, Western Samoa. Note: From 2010, Medge Consulting has the Scandinavia rights and are selling separately to national broadcasters. Canal + retain Polish rights, in a deal with French rights. Comprising: Argentina, Belize, Bolivia, Chile (games also on Chilevision), Colombia, Costa Rica, Ecuador, El Salvador, Mexico, Nicaragua, Paraguay, Peru, Surinam, Uruguay, Venezuela. Comprising: Angola, Benin, Botswana, Burkina Faso, Burundi, Cameroon, Cape Verde, Central African Republic, Chad (games also on Showtime), Comoros Islands, Congo, DR Congo, Dijibouti (also on Showtime), Eritrea, Ethiopia, Equatorial Guinea, Gabon, Gambia, Ghana, Guinea, Guinea Bissau, Ivory Coast, Kenya, Lesotho, Liberia, Madagascar, Malawi, Mozambique, Namibia, Niger, Nigeria (also on Hi TV), Rwanda, Senegal, Sierra Leone, Somalia, South Africa (also on SABC), St Helena, Swaziland, Tanzania, Togo, Uganda, Zaire, Zambia, Zimbabwe.